It begins with sparkling wine. Just the one glass because, on an empty stomach, one glass is enough to have an immediate effect. With a touch of light-headedness, a warm blanket of happiness descends as a towering steeple of treats is brought to the table. The bottom plate holds sandwiches filled with no more than two ingredients and cut into delicate fingers, no crusts. The middle plate is adorned with scones, jam and cream and your tastebuds are already clamouring to have these traditional baked delicacies in your mouth. The final plate is the crowning glory and its contents are entirely dependant on your location. One thing you can be sure of. The bite-sized sweets on this final plate will be truly delicious, and you’ll probably struggle to eat them all. To complete the occasion, teapots are dotted around the table, each containing either traditional or more exotic blends of loose-leaf tea. And so begins one of life’s true joys. Afternoon tea. I have had many an afternoon tea in Melbourne. Often with members of my family. Often for a special occasion. Often inside one of Melbourne’s famous landmarks. I now live in the land in which afternoon tea was birthed and could not be happier about this fact. During previous holidays in London, I have had quite a few afternoon tea experiences. 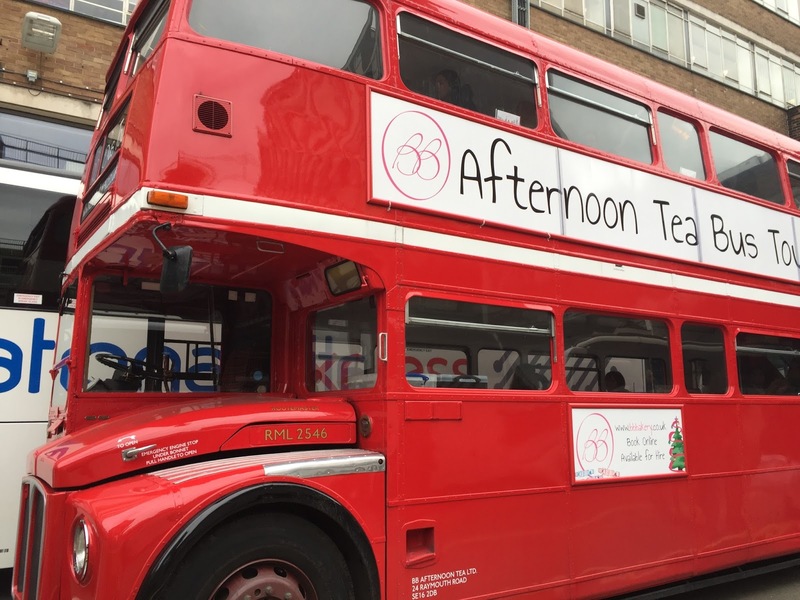 One even involved having afternoon tea on a double-decker bus (eating? not a problem. Sipping tea and not spilling it on myself while the bus was in motion? One of the hardest things I’ve had to do, ever). But I had yet to manage an afternoon tea since arriving in the UK as an aspiring Londoner. You may think it would be weird, or awkward at the very least, to spend an afternoon with someone you’ve only had online interaction with. But you would be wrong. Afternoon tea is itself a talking point. Taking delight in the treats in front of you takes at least a few minutes of your time, as does the divvying up of the top plate with its cupcakes and brownies and marshmallows and macarons. (Excuse me while I wipe away a little drool that has formed at the corner of my mouth at the memory of so much deliciousness…) And then, once your teacup is filled and your tastebuds are exploding from flavour, something magical happens. You can talk about absolutely anything. Some of the best (sober) conversations I’ve had, have happened during an afternoon tea. I don’t know if it’s the finger sandwiches, or the jam and cream, but something about the intimacy of the setting allows for a special kind of talk to blossom. And that, I think, is the real reason why I love afternoon tea…after the scones of course.